The Peanuts gang hops on a plane to Japan when their Little League team is chosen to represent the United States in an international baseball game in Tokyo! Between seeing the sights and taking in the best of Japanese culture, Snoopy, Charlie Brown, Peppermint Patty and the rest of everyone's favorite characters still manage to be their incorrigible selves. Charles Schulz was an American cartoonist, whose comic strip PEANUTS proved one of the most popular and influential in the history of the medium, and is still widely reprinted on a daily basis. His PEANUTS strip ran from October 1950 to February2000 and has been translated into 21 different languages in 75 countries. 4.0 out of 5 starsNot Schulz, but worthy of Peanuts. Like all Peanuts comics that are done without Sparky, this volume lacks his signature charm. However, since that charm is impossible to replicate, this shouldn't be approached with the expectation that it will achieve the greatness of Schulz's original works. 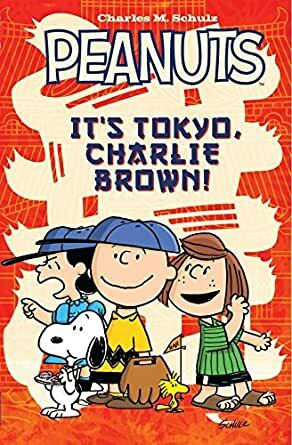 "It's Tokyo, Charlie Brown" is very cute and fun in its own right, and stays very true to the spirit of the original. All the characters have the right feel and none of the narrative action alienates the reader; it all feels believable in the world of Peanuts. However, the main crux of the plot, wherein the President of the United States himself asks Charlie Brown's baseball team to represent the country in Japan, certainly feels like a bit of a stretch. But hey, if the Lovable Loser can achieve such iconic status in real-world culture, why not a little recognition in his own world? The Snoopy/Woodstock vignettes are vintage silliness, feeling like they were ripped right out of an animated special. In fact, the entire comic feels like a paperback version of an animated special. That's not a bad thing, especially if you put a little Vince Guaraldi on in the background while you're reading. I enjoy Japan and Japanese culture myself, so I liked seeing these beloved characters in this setting. Probably my favorite page in this entire book comes at the end: a full-page artwork entitled "Umbrella Girls" that features Violet, Lucy, and Sally in traditional yukatas sporting oil-paper umbrellas. Never thought I'd see anything like that, and it's as adorable as it sounds. Overall, while it can't achieve greatness, it does achieve worthiness. This belongs in your collection. Product was as described and pictured. The book was well-packaged and received in great condition - no tears, rips or bent pages. Arrived quite quick considering it came from England; much faster than expected delivery date. Originally I bought this for my mom who loves Peanuts but after reading through, seeing the cute drawings and storyline, I might keep it for my library. 4.0 out of 5 starsCharlie Brown in Japan? I was very excited about the Peanuts gang exploring the wonders of Japan. It was a bit of a surprise that their baseball team was chosen by the president himself. Then again, this takes place in the same world where they just hand-wave Snoopy's unconventional behavior. I also love the fact that the new creators don't resort to lampoons and crude humor. It was like the spirit of good ole Charles Schulz himself wrote this very comic. I hope for many new stories to come that will hopefully include the untold stories of Snoopy's other siblings. The book itself is a great format. Good size. Easy to hold. Glossy, bright and ccolorful. My kids have read this book dozens of times in the last few months. They are also studying karate, so its andappropriate tie-in to their physical and cultural education.